Manufactured by Jungbecker, this high precision conical de-glaring prism (CDP) sheet gives optimum glare control and 65’ cut off angles, for excellent UGR ratings. 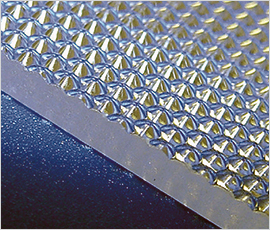 CDP is a high-transparent and micro-structured prism surface that provides a unique de-glaring in the plane of the sheet. Prisms are established as cones, optimised by numerical algorithms. High efficiency, smooth de-glaring with opal appearance are the key features of this product. Grey colour material increases the de-glaring effect. Available in both acrylic and polycarbonate and in 3mm thickness only, CDP is the obvious choice for superior LED light control.